This panel honors activist Roger Lyon, who died of AIDS in 1984. Shortly before his death, Lyon testified before Congress to appeal for funding to combat the growing epidemic. One of the greatest challenges in the fight against AIDS was changing public attitudes toward the disease and its victims, who were predominantly homosexual men. 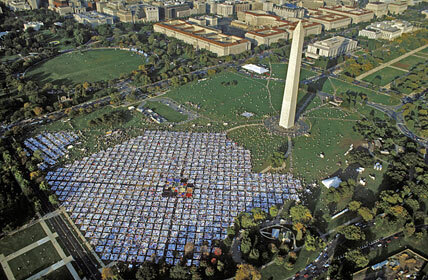 To awaken a seemingly uncaring nation to the magnitude of the crisis, activists created the AIDS Memorial Quilt. Through its thousands of panels, each with a personal story, the quilt has served as a call for compassion, education, and action.